I didn’t think switching from an iPod Touch to an iPhone would make such a difference, but as I’ve said in previous posts I’m finding that I’m using my iPhone way more now. Seeing as I use it every day and almost every hour, I’m still looking for the perfect case to protect it. Well, my perfect case. I do think that everybody requires something else depending on how they use their phone. 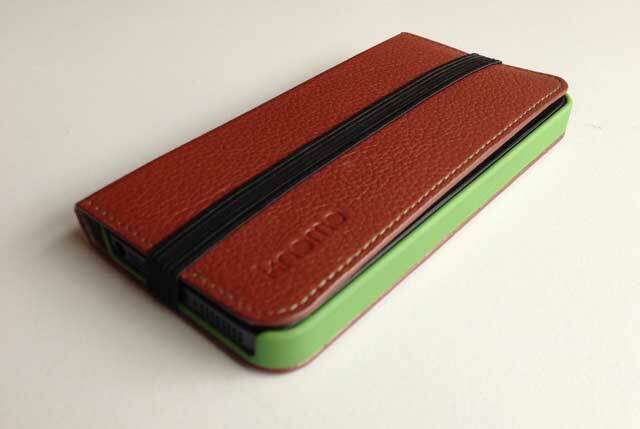 Like most Knomo products the Leather Folio case is sleek and well designed. The iPhone snaps into place in a shock-resistant plastic casing, while the back and front flap is made of a nice smooth leather. It also has an elastic band to keep the leather flap secure. You can get it on the Knomo website for £45 and comes in two colours: Black and Cognac. I liked the Folio case and it indeed suit my needs much better than the previous cases I’ve tried out. The iPhone snaps easily into the casing and you have open access to all buttons and switches. I quite liked that the case protects my iPhone completely. It’s not the sleekest of cases and it’s pretty obvious you’re using a case, but I prefer that then having the front of the phone naked and unprotected (especially when in my bag). I didn’t end up using the elastic band at all, at least not for what it was intended. I want the flap to cover the front of the phone, but I don’t want to go through the trouble of messing around with the elastic each time I want to open it. Unless you have a lot of cards or other stuff in the inner flap’s pocket, the Folio normally closes quite nicely. What I did end up using the elastic band for was to keep it more secure on my hand while I went running. I don’t like using an armband during running, cause you can’t really see what’s on the screen or easily change settings. But holding your phone just like that in your hand also doesn’t feel right. With the elastic band on the Folio, I quite felt at ease running with my phone. It’s not what it was intended for, but it gave me that extra confidence that it wouldn’t just slip out of my hand. My main annoyance about the case was taking photos with it. Most of the time when you’re using the phone in that case, you flip the flap around so that it’s against it’s back. But when taking a photo that of course doesn’t work: you’re covering the camera. So you have to awkwardly hold the flap sideways while trying to take the photo. And rotating the phone to use the camera horizontally (so that the buttons are on the top) is even more annoying. You finally get the hang of how to deal with it, but you still look like an idiot each time you take a photo. The main reason why I don’t want to invest in one yet (cause it is on the pricier side of cases at £45) is the range of colours. There are only two colours so far: black and cognac. Which would be fine if the entire case was that colour. With both of them though the plastic casing is an olive green and I’m just not digging that colour combination. I’d so be in love with this case if the leather was red or pink or purple or blue and the plastic casing was black (or the same colour as the leather). Maybe even if the entire thing was just plain black. But the current colour combinations? Not really digging those. All in all, the Leather Folio case is a great case, although it won’t suit everybody’s needs. If you want a case that protects the front of the iPhone, the Folio is great. I just wish they had a nicer range of colours, otherwise this would have been exactly what I wanted. 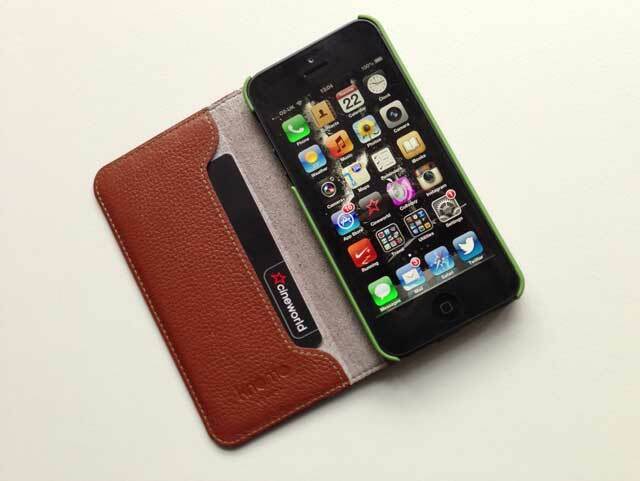 The Leather iPhone 5 Folio Case is available on Knomo’s website. Knomo provided me with a review copy for the purpose of this review.